"Bossa Nuevo' s self-titled debut recording is filled with color, texture, groove and melody. The project offers airy, organic, fresh new interpretations of works by great Brazilian composers like Gilberto Gil and Antonio Carlos Jobim plus a stunning version of Astor Piazzola's "Soledad." Each track is unique and offers a snapshot of the great artistry and collective dedication of these seven musicians. There are so many wonderful moments and each listening offers new surprises. 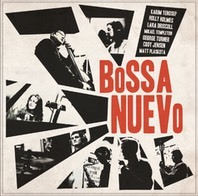 Bossa Nuevo is a great band, even more so in live performance and this recording captures its spirit. Catch them whenever you can!" This project was conceived and produced by bandleader Karim Yengsep, with the help of a Grammy winning saxophonist, arranger, and educator Chip McNeill, and recording engineer Mark Rubel at Pogo Studio in Champaign, Illinois. The album was mastered by the late Jon Schoenoff at Artist Mastering at Krannert Center for the Performing Arts. Graphic design was created by Jake Thompson, based on a Black & White film photography of David Cubberly that was shot during the first recording session at Pogo Studio.